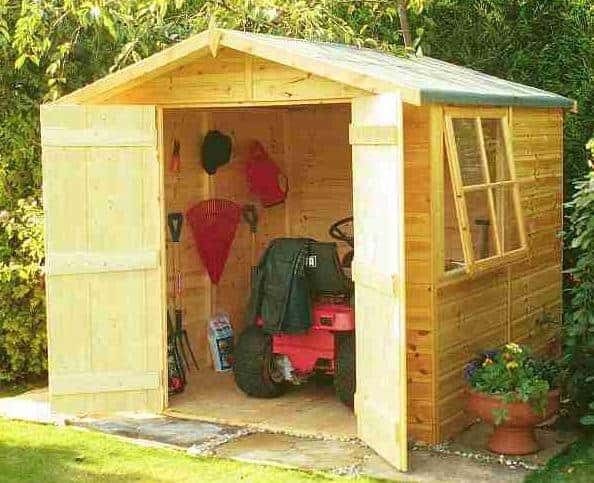 This gorgeous medium sized shed has some spectacular features. Part of the popular Shire collection, it offers a strong, secure place to store equipment and tools. Almost the entire building benefits from tongue and groove construction, making it ideal for heavyweight equipment such as a ride on lawnmower. There is one opening glass window supplied on the shed and its panelled design sets it apart from the majority of shed windows supplied on budget models. We’re actually surprised by the affordable cost of this shed. There are a few things that could be improved such as the roofing felt, but overall it gives you exceptional value for money. The double doors offer outstanding extra-wide access into the shed, making it simple to store anything, no matter how bulky. It offers a good amount of internal space and the Shiplap tongue and groove walls allow you to easily install interior shelving. You can also add hooks to hang heavy tools if required. Though it is impeccably durable, it doesn’t come with much security. Therefore we’d advise buying a padlock to fit onto the pad bolt supplied. Not only does the Shiplap cladding give the shed a more stylish design, but the manufacturer has added a honey brown basecoat to the building. This really gives it a chic style and sets it apart from the majority of competitor sheds which tend to feature a natural, unpainted finish. Roof felt supplied isn’t the best quality. 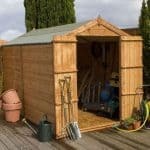 Shed Store do not offer a thicker felt, but you can find them online and they aren’t very expensive. Does not come with a lock so you will need to buy one separately. This thick, wooden Shiplap storage shed is equipped to handle heavyweight storage. Internally there is a large level of space and the height of the building means you can store very tall equipment with ease. The doors also offer substantial space to get even large, bulky tools or equipment in or out of the shed. Compared to other similar sheds, this one offers very impressive measurements that should suit most households. The apex roof gives this shed a fantastically tall design. One of the biggest benefits of apex roofs is the fact they provide so much internal height. It doesn’t just make storing taller tools and equipment a lot easier, but it also makes the building more comfortable to walk around in. It’s a little strange that the roof is built from solid sheet materials when the rest of the building features tongue and groove cladding. However, it does have a thicker than standard design, measuring 11mm thick. It is covered by a basic roofing felt which you might want to upgrade. The floor on the other hand, benefits from very strong tongue and groove timber. At 12mm thick, it is strong enough to hold any equipment and even small machinery you might have. 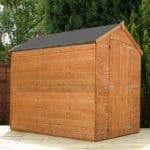 It helps to provide a very durable and long lasting support and in our opinion, highlights the exceptional quality of the shed. The walls are created with 12mm tongue and groove Shiplap cladding. This is pretty unusual to find on budget buildings. Most tend to use overlap cladding as it is much cheaper to work with. The thickness of the cladding makes it not only more weather-resistant, but also more secure against theft. Most importantly for many customers however, is the fact it gives the shed a much more appealing design. You’ll see it has a smooth finish; another benefit over the rough looking overlap sheds. 35mm x 35mm framing is used on the interior, giving the building a fantastic robust support. This ensures the building stands strong for years. One thing you’re bound to love about this building is its unique honey brown colouring. This is thanks to the treatment applied before the shed is shipped. Both the inside and the outside of the timber has been treated. You will need to add a top coat treatment within 3 months, but the fact you don’t have to treat it straight after assembly is an advantage. It is one of the lower maintenance sheds, which again is pretty unusual for a value model. You can clearly see that the double doors on this shed aren’t as wide as they are on some competitor buildings. However, they are still wider than average and do open out to reveal a lot of access space. As highlighted in the picture, there’s enough space to get a ride on lawnmower in here. So you won’t need to worry about getting anything bulky or large into the shed. They are secured with a pad bolt which will keep them closed, but not locked. A glass, openable window is fitted on the side of the shed and it is actually one of its main focal points. 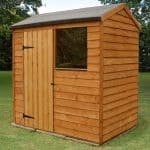 The window can be placed on either side of the shed giving you greater flexibility on where you can assemble the building, Unlike most sheds, particularly in this price range, the window comes with a stylish panelled design. The fact you can open and close it is also a big advantage as you can make sure the building is ventilated in hot summer weather. More officially, the Shed Store describe the window’s design as a ‘mortice and tenoned criss-cross window’. The security of the building is disappointing. 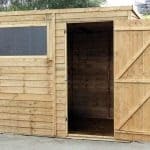 Although this is an affordable shed, we do feel the cost should include some security. Of course the thick walls do offer security and we do like that the window has an inside lock. However, the only form of protection given on the double doors is a pad bolt. This is merely more effective than a turn button catch at ensuring high winds don’t blow the doors open. It won’t stop thieves entering the shed and you will need to buy a padlock. The criss-cross panelled window also limits how much privacy the shed has. As recommended with all tongue and groove clad buildings that feature windows, you can install a covering such as curtains or a good quality blind. This will solve your privacy problem and give your shed more individuality. You only have one extra choice with this great shed and that’s an installation service. This service is specifically offered for the Alderney building and we do recommend it if you can afford it. The service may seem like an expensive cost, but due to some of the features of this building, it is certainly worthwhile. A team of professionals will come and erect the shed, then clear everything away in record time. You can just sit back and then enjoy the benefits of this attractive building without stressing about where everything is supposed to go. There’s nothing to dislike about the quality of this shed. It is both attractive and durable thanks to the Shiplap tongue and groove walls. The interior of the building also has an expert design. All in all it oozes quality and offers a very stylish storage space. One of the best things about this shed is the fact that it has clearly been built to last. It still requires treatments to keep it protected against the British weather, but even the shed’s interior is constructed from thick, durable high quality timber. Considering it isn’t the largest shed on the market, this one still provides a great spacious design. It should be suitable for most people’s storage needs and it also provides plenty of shelving potential too. The apex roof makes it easy to store tall tools and the floor accommodates heavy equipment. You will struggle to find a better similar sized shed. You shouldn’t come across too many issues during the assembly of this shed. However, the window, doors and roof may prove a little trickier than the actual panels. The good news is the shed comes with brilliant instructions that make the process much simpler. 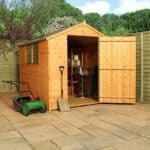 It’s hard to believe a shed with so many benefits and with such a solid construction, comes at such an affordable price. 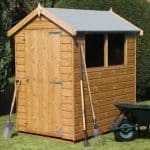 If you’re looking for a top quality shed that won’t break the bank then this is definitely the one to buy. Final Thoughts: This is one of our favourite mid-size sheds available. Its stunning honey brown colouration gives it a warm, cosy and welcoming design. It also manages to pack in some pretty good features considering it comes at such an affordable price. The opening glass window with its panelled design, adds both practicality and style to the shed. With strong tongue and groove cladding on the walls and floor of the building, it is great for heavier storage including large, heavy lawnmowers, BBQs and sacks of compost. The only things that you may want to improve is the roof felt and you will need to buy a padlock to keep your storage safe.